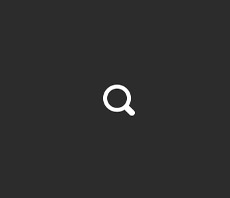 Please check required fields (*) or fields format. 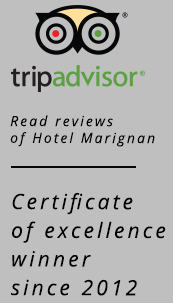 The Hotel Marignan is located in a small, quiet street of Paris, in the city center on the left bank in the famous Quartier Latin district. 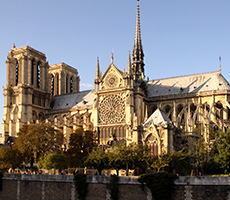 The Hotel is only a five minute walk from Notre Dame, the Luxembourg Gardens and others important sights in Paris. Whatever the reason for your trip, business or leisure, the Hotel is an ideal accommodation. 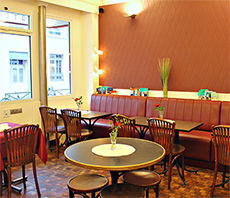 Hotel Marignan, in the Keniger family since 1955, has been a meeting place for international guests since its opening. 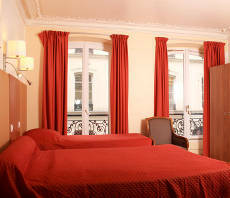 Because of the ideal location of the hotel near la Sorbonne in the historical center of Paris, many intellectuals, writers, artists, students and academics have stayed in the hotel. The famous American poet e. e Cummings, the French/Romanian philosopher, Emil Cioran, the painter, Mordecai Ardon, the writer and director Tadeusz Konwicki, the artist and theater director Tadeusz Kantor, the poet Avrom Sutzkever, Zorba the Greek author Nikos Kazantzakis and the anthropologist Jacques Ruffié have all stayed in our hotel over the years. We offer clean and comfortable accommodation for up to 5 people with competitive prices that include many free services. Our staff will be happy to welcome you and advise you how to make the most of your stay in Paris.